Leverage your investment in tracking equipment with a sign that works 24/7. 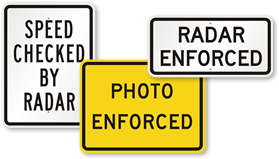 Select from the Speed Checked by Radar Signs and send an alert to drivers about the photo and video equipment that verify speeders’ vehicles. • Great for high traffic areas. Reflective signs are clearly visible in the dark. • Signs are resistant to chemicals, UV rays, water and abrasion lasting up to 10 years outdoor. • Burr-free rounded corners and pre-drilled holes for hassle free installation. • Printed with 3M screen printing technique to sustain outdoor traffic. If too many people seem to be trying to drag race on your property, you should post a Custom Speed Limit Sign to remind them to slow down.